Ismaily's home African Champions League clash against Tunisia's Club Africain was called off by Cameroonian referee Neant Alioum in the dying stages following crowd trouble at Ismailia Stadium on Friday. After several stoppages as Ismaily's angry fans kept hurling bottles onto the pitch, Alioum eventually decided to cancel the match in injury time. He was escorted from the pitch by security personnel amid unfortunate scenes, around six months before Egypt stages the African Cup of Nations, with Ismailia one of the cities that are scheduled to host the 24-team tournament. Africain fell to an early goal from Ismaily's new recruit Benson Shilongo but two penalties from Ghazi Ayadi turned the match on its head, with the second in particular sparking furious protests from the passionate home fans. Alioum initially awarded a free kick after Yassine Chamakhi was tripped by Richard Baffour on the edge of the area, before changing his mind after consulting one of his assistants. Television replays showed that the contact occurred outside the area. The second-half kick-off was delayed as tensions boiled over, reaching a climax about five minutes from time when the linesman rushed onto the pitch to avoid being hit by a barrage of projectiles. 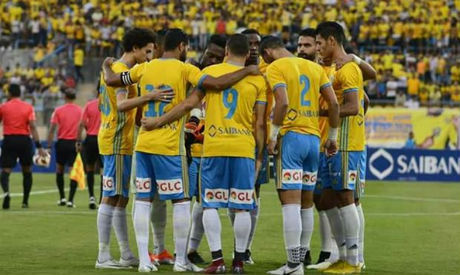 With the crowd trouble showing no signs of abating despite repeated pleas from Ismaily's technical staff, Alioum decided to call off the match, throwing the team's participation in Africa's flagship club competition into doubt. According to the regulations of African governing body CAF, Ismaily could face expulsion from the competition. They lost 2-0 to DR Congo's Mazembe in Lubumbashi in their opening match before falling against Club Africain. The visitors had the first sight of goal after three minutes when Chamakhi's angled low shot came back off the post but Ismaily went ahead five minutes later, sparking wild celebrations in the stands. Shilongo cut ahead of his marker to superbly volley home an inviting cross from left-back Tarek Taha. Ismaily were pegged back after taking the lead, with Club Africain's Ali Abdi sending a free header just wide. The Tunisians deservedly leveled the score on 40 minutes when Ayadi's powerful spot-kick struck the keeper's hands and went in after midfielder Mahmoud Abdel-Ati, who is on loan from Zamalek, was punished for a handball. Ayadi then sent the keeper the wrong way from another penalty to put Club Africain ahead, further enraging the supporters. Ismaily dominated possession in the second half but failed to carve out openings. They also had a strong penalty claim waved away by Alioum in the early stages of the second period.